He was born in Calcutta, West Bengal. 1955-66 He joined weavers service centre office of the Handloom Ministry of Textile Govt. of India. 1960 Founder member of the Society of Contemporary Artists, Calcutta. 1963 Member de la Societe des Muses Nationale d` Art Moderne, Paris. During his Govt. service he worked with Mrs. Pupule Jayakar. 1979 Elected Member of Purchase Committee for National Art Exhb. and Miniature Format Exhb., also for sculptor exhb. 1980 Joint Secretary of Contemporary Artist, Calcutta. 1981 Invited as Jury for Hyderabad State Akademi, Hyderabad. 1982 Committee member of 5th Triennale India. 1982 Elected jury member for National Exhb. of Art, Lalit Kala Akademi, New Delhi. Member of the General Council, Lalit Kala Akademi, New Delhi. Lives and works in Kolkata. 1956-60 Studied at the Govt. College of Art and Craft, Calcutta. 1960-63 Studied at the cole Nationale Superieure des Beaux Arts, Paris. Research in Fresco and Mosaic with Monsieur Shoppla Midi and Monsieur Anjam, Paris. Graphics Art with William Hayter and Krishna Reddy, Atelier-17. Research in Painting Atelier Julian, Paris. 1958 Solo exhb., Cotton College, Guwahati. 1961 Solo exhb., Club de 4 Vents, Paris. 1962 Exhb., Galerie Foyer des Artistes, Paris and Galerie Jean Lafoud, Paris. 1963 Solo exhb., Galerie Maison de Beaux Arts, Paris. 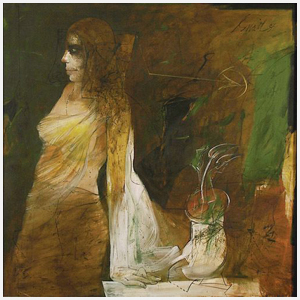 1968, 72 Solo exhb., Birla Academy of Art and Culture, Calcutta. 1975 Exhb., Poiker Gallery, New York. 1976-78 Exhb., Basle, Zurich, Dusseldorf, Hamburg, New York, London, New Delhi, Calcutta. 1979-80 Retrospective, Kuala Lumpur, Basle, New York. 1984 Confrontations, sponsored by ITC, Jehangir Art Gallery, Bombay. 1986 Trends in Bengal Art, Commonwealth Institute, London. 1994 Recent Drawings, CIMA Art Gallery, Calcutta. 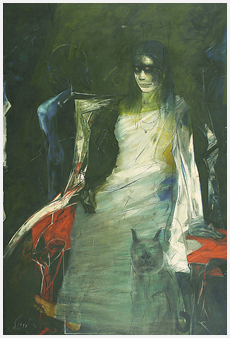 1998 Solo exhb., Gallery Mohanjeet, Paris. 1999 Solo exhb., San Francisco, USA. 2000 Exhb., Suntache Gallery, Monsur. 2000-01 Solo exhb., Art Heritage, New Delhi. Center, Mumbai and Delhi Art Gallery, New Delhi. Tamil Nadu State Akademi, Chennai. Lalit Kala Akademy, New Delhi. Masanori Fukuoka & Glenbarra Museum, Hemeji, Japan. Dhoomimal Art Gallery, New Delhi. Tata Iron & Steel Company, Jamshedpur. Gallery Art & Data, Germany. Birla Academy of Art & Culture, Kolkata. Galerie Rene Bretent , Paris. Tata Engineering & Locomotive Company, Jamshedpur. American Express Bank, New York. 1959 Received National Award, from West Bengal Govt., Calcutta. 1960 Gold Medal, Calcutta University, Calcutta. 1960 Gold Medal, Academy of Fine Arts, Calcutta. 1960 Gold Medal, Govt. College of Art and Craft, Calcutta. 1960,67 AIFACS Award, New Delhi. 1960 Received award, Hydrabad Art Society, Hydrabad. 1960 Received award, Bombay Art Society, Bombay. 1960 Record winner of six state awards in a year from West Bengal Govt., Calcutta. 1961 Won a French Govt. Scholarship to the cole Nationale des Beaux- Arts, Paris. 1978 Received the National Award, for his oil painting `Rotation of Mankinds`. 1983 Commissioner IV Triennial, India and on the jury of the Prix des Etrangere, Paris. 1989 Commissioner at the Sao Paulo Biennale, Brazil. 1991 Received Shiromani Purashkar, Calcutta. 1998 Inaugurated Australian Tapestry Exhb., Birla Academy of Art and Culture, Calcutta. 1998 Inaugurated Group Show, Oxford Gallery, Calc. Sunil Das enjoys a unique position among the frontranking artists of India. His line is an experience that cannot be described in words. In the world of line, he is able to create a velvet measure of dynamism. In terms of inventive desire, momentous discoveries and the potent power of the line, the artist reigns supreme and strategic. His eternally favourite bull and horse always plays a very important role in his works.